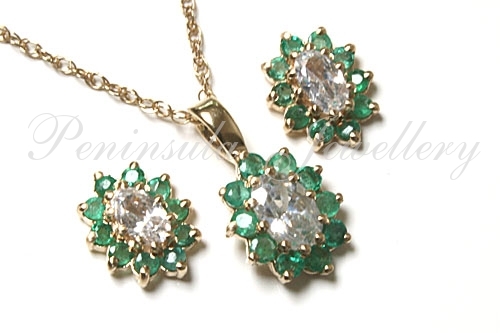 Traditional cluster pendant featuring ten 1.5mm round brilliant cut Emerald gemstones which have been claw set, surrounding one 6x4mm Cubic Zirconia gemstone. Complete with 9ct gold fittings. Dimensions: 8mm wide, 15mm long including fixed bail. Complete with 9ct gold 18" Prince of Wales chain. Stunning stud earrings, featuring one 5x3mm oval Cubic Zirconia gemstone surrounded by 1.5mm brilliant cut real Emerald gemstones. Standard 9ct gold fittings. Overall dimensions: 9x7mm. Made in England. Presented in a luxury gift box – Great Gift! !